Wildlife observation. We have a resident family of three Sandhill cranes that wanders back and forth among my yard and the neighbors on either side giving them about 10 acres to cover. They were strutting about George’s this AM when I went over to water the garden and since they are used to me now intruding, we shared the space with no problems at all. I had noticed that one particular area of his field, a 20’x20’ patch, had been getting more and more torn up as if someone was hitting it with a tiller or garden hoe. Turns out it’s the Sandhills and they were pecking it vigorously obviously digging for food. I never was sure what they ate but it’s clear they’re digging for worms, grubs, or whatever else might be living in the ground. The part that surprised me the most was how deep they were digging. They have pointed beaks that look to be 12”-18” long and they were stabbing down the whole length of their beaks. You also have to wonder why they have chosen that one, average looking spot out of the large area equally available to them. I’m sure they know what they’re doing, it’s just interesting. Got a nice surprise in the garden this morning. Remember me mentioning that New Zealand spinach is supposed to handle the summer heat? Well it didn’t and about a month ago I pulled out all the dead vines. That was the last of my greens until next November. As I was weeding that area today I noticed some bright new green just sprouting. Upon closer examination I saw that it’s the spinach rejuvenating. I don’t know if it’s sprouting from old rootstock or germinating seeds but whatever the source, it’s happening. And it’s happening in 95 degree, lots of sun weather. I let the last crop get totally out of control in terms of spread but will try to keep this better managed in hopes of having some blendable greens by the end of August – about 3 months before the kale and collards reclaim their control of the ninja. By control I mean thinning the plants much earlier and maybe transplanting some to places with some semblance of shade. Well it’s time to fish or cut bait – referring to picking a pineapple. I checked the grocery store offerings again and for sure mine look identical in terms of size, color, and the size of the leaves growing out the top. I’ve also notice the plants have put out new sprouts from which I assume new fruit will form. That may also be a sign that the plant is ready to be shed of the old and start anew. 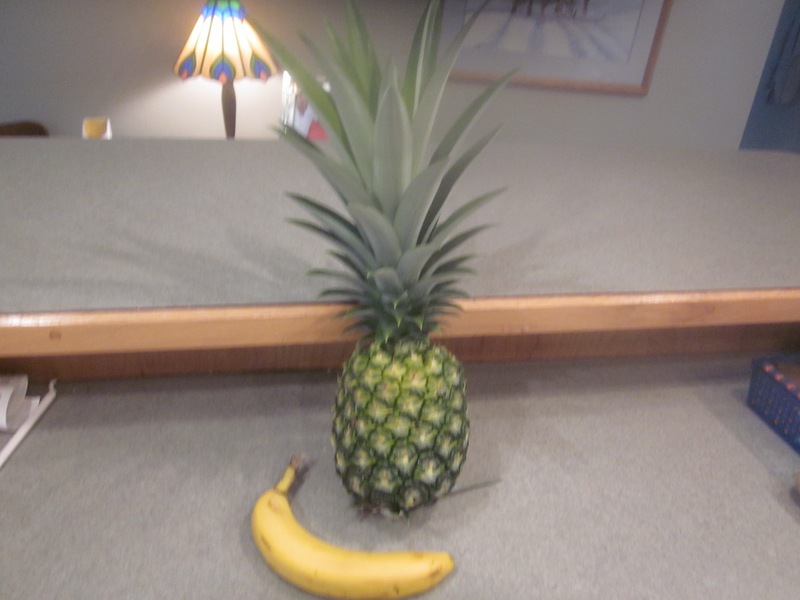 I did a little research and learned that I should pick a fruit and then let it sit a couple of days before cutting into it. I also learned that a single plant will continue to put out new sprouts or pups and those in turn will eventually produce fruit (and more sprouts). There’s not a season and the plant will put out a fruit “when it feels like it” as opposed to any kind of schedule. So with new sprouts popping out and replanting fruit tops as we eat them, there can be an ever growing crop with fruit happening nearly continuously. They get most of their nutrition from the air so no need to fertilize or worry about the soil. Seems like the only danger is frost so I need to be sure to keep them nice and warm during the winter. Getting ready for the fall tomato season. Checked and I have the seeds I want; Checked and compost pile #1 will be sufficiently cooked to heavily dose the tomato plants; checked and the row being solarized is heating up nicely so the nematodes should be crispy critters. The game plan is to plant the seeds in the house this coming weekend in preparation for a Labor Day planting in the garden. I also checked and I have plenty of squash and pole bean seeds for late September planting. When I remove the plastic from the row currently being solarized, I’ll move it to a new row where the squash will live so it’ll have a couple of months to cook. I’m still adding new material to compost pile #2 that will be part of the October planting. The way my system works is that when I move the compost from pile 1 to the garden, pile #2 becomes #1 and gets no more input. All new stuff goes into the new #2. Make sense? I get a new pile into the garden every 3-4 months or so, depending mostly on the weather. I do have a large change coming in the compost generation area. 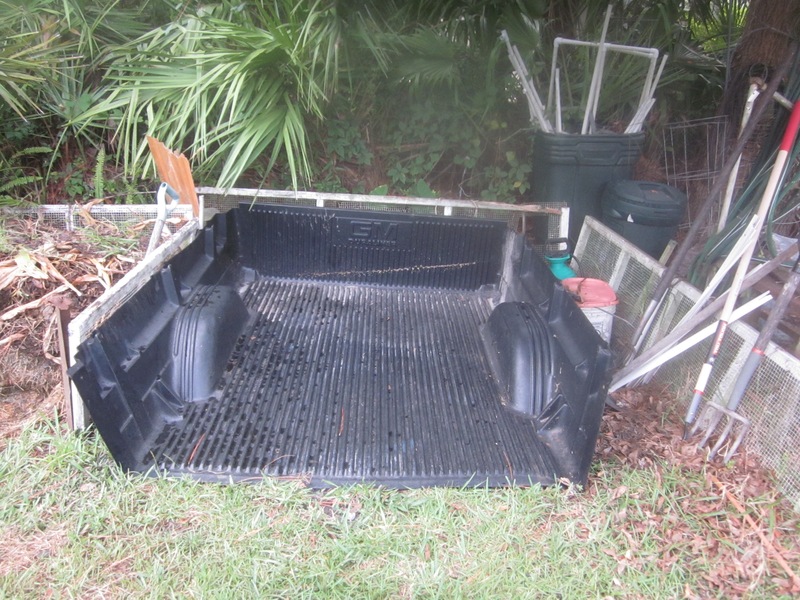 A friend of George’s asked me if I wanted a pickup truck bed liner for a compost pile lining. It’s for a full sized truck, 8’ bed, and being black, should heat up nicely. I moved the contents of pile #1 to the garden and moved the bed into that location, drill drain holes, and will start the new compost in it. Nancy made something new for supper – a Rueben Casserole. If you like Rueben’s you’ll like the casserole. 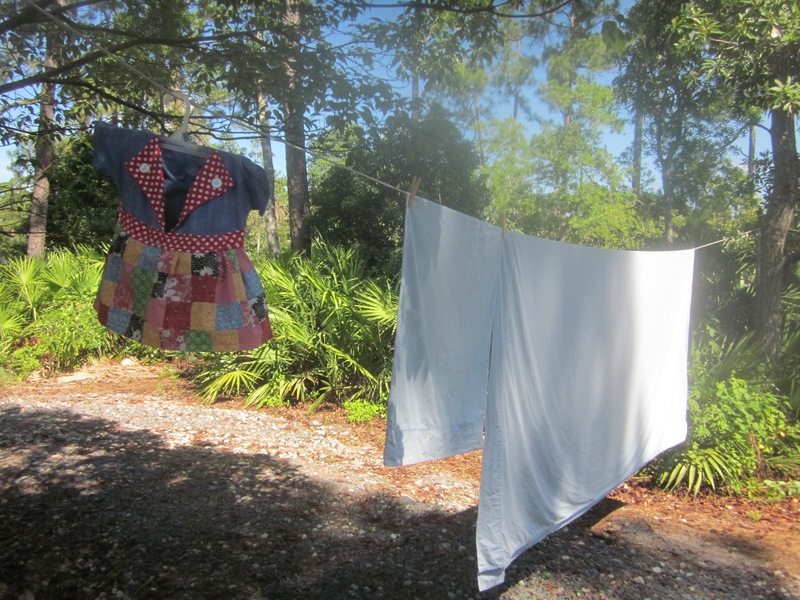 She also put together a new clothespin bag so we have the fanciest one in the neighborhood if not the galaxy. It’s looking more like this will be a Trump-Clinton election which complicates my voting this year. I’ve always had an easy choice but not this time. I can’t vote for Clinton and I can’t vote for Trump so I have to select a write in candidate. I don’t want the job so I won’t write in my name. I don’t think Nancy would be interested so that’s a non starter. My kids wouldn’t be interested and I probably wouldn’t vote for them if they were. Steve Spurrier could probably make my short list. I saw Harrison Ford in some movie where he was the Pres and managed to save Air Force One from some terrorists so that would put him on the short list too. I liked the guy that used to be the PBS Car Guy but he might be dead and probably wouldn’t be interested. Jesse Ventura won; Arnold Schartzenager won; Al Franken won so anything is possible. So you can see what a conundrum I’m facing – so many choices. I like that Elon Musk guy but I don’t think he was born in this country. I have a mystery vine growing in the garden. I’m guessing it’s a melon of some sort since cantaloupe and watermelon residuals are often pitched into the compost pile. Lots of leaves so far but no blossoms. It popped up in a large unused area so I’ll just let nature take it’s course. If nothing else, the vegetation will end up as compost. When I’ve tried to grow melons in the past, they start out looking good but before any melons can mature, the critters find them. Maybe by accident we’ll have some luck this year. One problem we have in Florida (and maybe everywhere else) is that over time car’s headlight covers cloud over so they lose effectiveness over time. It’s significant enough that you can be ticketed for it. I noticed it on the Toyota- even though it’s only 20 years old – but it looked like a larger job to replace them than I cared to entertain. Besides, I rarely drive that car at night anyway so it wasn’t a pressing issue. The other day I noticed my neighbor squirting something on his headlights and wiping them off with a small hand towel. I asked what he was doing and he said that his headlight covers were so bad he couldn’t safely drive at night and that someone had told him to clean them with Deep Woods Off, a mosquito repellent. I watched as they cleaned up like new in just a few seconds. The next time we got to Walmart I picked up a can – I was doubtful that it would work on mine but we can always use the repellent. Sure enough, it cleaned them up with a minimal effort. Work continues on Garret’s house. The particle board siding is totally done on the ground floor and half finished on the second story. We should finish that part of the job this coming weekend. The new windows are installed on the ground floor. The interior, both floors, is mostly demolished to make way for a complete remodel. As we had hoped the studding on the second floor was, for the most part, good with no rot or termite damage. The afternoon heat makes it really tough going on a sustained basis. To me this is the hottest summer I can remember here – 95 degrees and “feels like” temps of 105 all this week. Way too hot to fish although I may give the surf a shot on Friday. Nancy has a bridge game going in Palm Coast so I might take that opportunity to give it a try. But it is scary to think about being on the beach from noon to 3PM. And, I’m calling the swarming ant attack over and done with. Haven’t seen one in the last three days – contrasted to the hundreds we were seeing between 5PM and 7PM every day. I don’t know if all the stuff we sprayed finally took it’s toll or that they all hatched and start another cycle but for now, relief. Starting to see some progress on the house rebuilding project. The framing is mostly done except for potential wood rot on the second floor and we’ve started putting up the 4’x8’ particle board sheets, aka outside walls. Those go up quickly and give it a finished look as compared to just open framing. Putting up these sheets on the lower level is easy but it becomes challenging at the upper levels. We used a 2”x6” plank between two ladders as scaffolding but it takes two guys to handle the sheets on the ground and two on the scaffolding and it’s just very awkward and dangerous. George to the rescue. 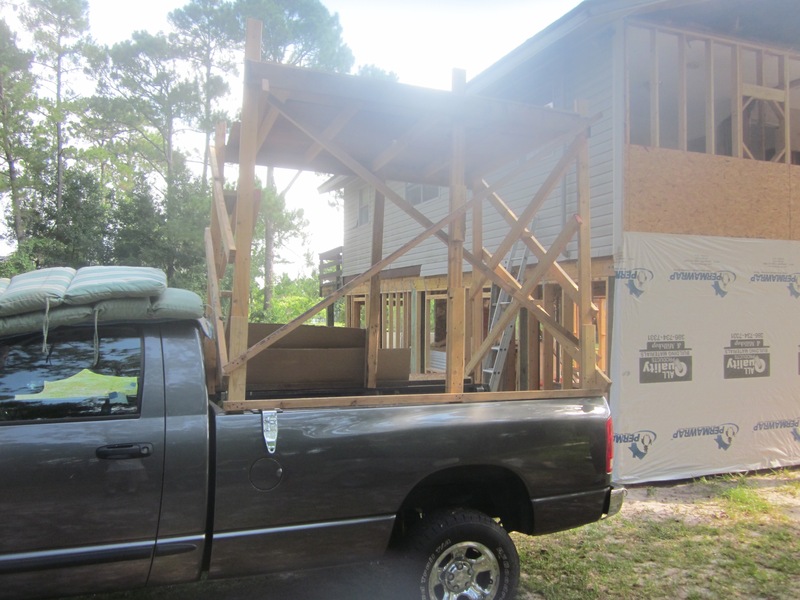 He came up with an idea for a mobile scaffolding using his pickup truck as the base. See the pic. It took us a day to build it and it works like a champ. We reached a big milestone this weekend when the south wall was completed in terms of finishing all the framing, restoration and installing the first layer of cover – particle board. Although this is a small wall, it had the most termite and water damage and was essential rebuilt 100%. The bad part of putting up the walls is that it gets hotter inside and I do mean hotter. Too hot to garden. The only thing surviving at this point are a couple of cherry tomato plants, eggplants, and a few pepper plants. No greens for the smoothies so that’s a bummer. Sweet potatoes seem to be doing just fine but we won’t really know on those for a couple of months. I think we finally have the swarming ants under control. After I gave the jacuzzi enclosure another, super serious blast of powder it seems we’ve turned the corner. On Saturday there were maybe thousands in the tub; hundreds on Sunday; dozens on Monday and one or two stragglers on Tuesday. TV still working although it hasn’t had to perform in seriously stormy weather. Update – worked fine for the past couple of days with plenty of rain and lightning. I’ve still got an itch to add another small amplifier inside the house to see if an extra 10db’s would pull any more stations out of the mud. Up until about 2 years ago we got channel 56 very well and then it disappeared. My neighbor still get’s it on occasion so I’m fairly sure it didn’t just turn off. A small, indoor amplifier costs about $10 so why not try. Icemaker glitched but I fixed it in about 5 minutes – practice makes perfect. And I’m not exactly sure how to tell when the pineapples are ready for picking. I checked out the one’s in Publix yesterday and they look exactly like ours – about the same size, color, and with the same size fronds coming out the top. I’d really hate to cut one off only to find it was not quite ready after nursing it along for over a year.